Large wild canines are becoming more common in Ohio. Apparently my friends weren’t the only Ohioans to have large wild canines running around on their property. Not only was my blog about a Coy Wolf sighting widely read, but we also received some interesting new information and photographs from readers. 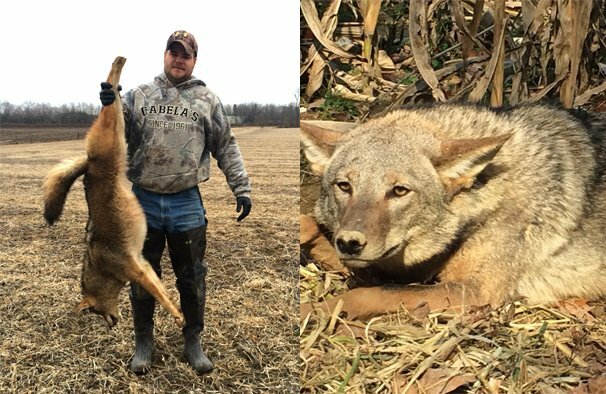 Unfortunately, Tyler McMillen also has large wild canines causing problems on his family’s farm near Granville and on the hunting preserves and cattle farms where he works in Morrow, Delaware and Knox counties. The cattle farm in Morrow County had coyotes attack and kill livestock this fall. 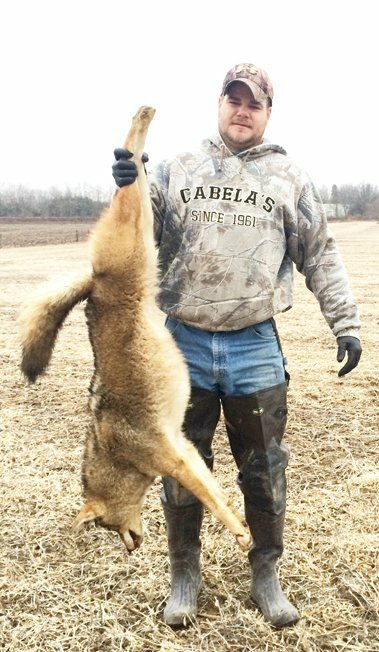 Tyler captured this coyote on his family’s farm near Granville. It is not surprising that livestock has been killed when you look at his photos from his trail cameras and you see the number and size of the coyotes working together. “Eleven trail cameras have picked up multiple pictures of the rascals prowling around, and I believe that their population numbers are on the rise,” he said. To date, Tyler has managed to eliminate five coyotes. “They are very smart,” he said. Did you know that coyotes are not native to Ohio? According to the fact sheet, they entered the Buckeye state in 1919. “The immigration of coyotes into Ohio is part of a natural range expansion into eastern states following the removal of wolves and fragmentation of forests for agriculture,” the fact sheet reads. “Mating takes place January through March, with a peak in February. During this time coyote packs increase their territorial behavior. They maintain their high degree of territorial defense through April, when pups are born to the alpha pair. 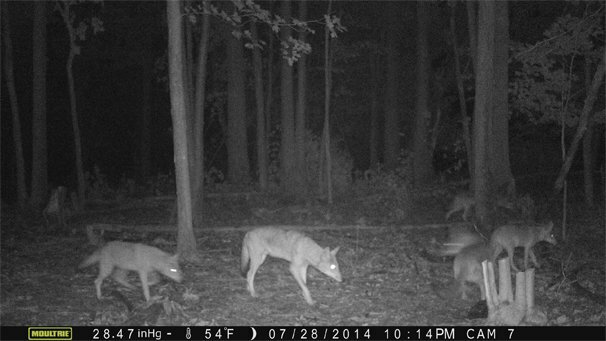 Tyler’s photos from trail cameras prove that coyotes are in abundance on the Morrow County farm where he works. 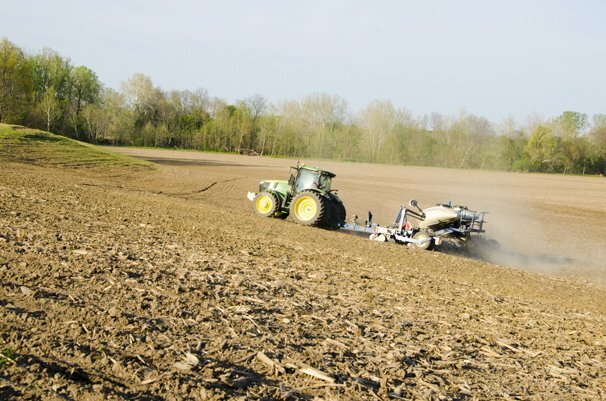 Livestock depredation often peaks during spring because of the availability of lambs and calves, which coincides with an increase in energy demands for alpha pairs raising newborn pups. Studies have shown that resident coyotes usually have little interest in livestock until a litter is born. The alpha pair is usually responsible for most predation events within a territory. For controlling the populations and damage caused by coyotes, the fact sheet suggests special fencing techniques, modifying livestock movement to decrease their territorial overlap with coyote habitat during peak seasons, using guard animals, employing scare tactics, and integrating trapping and shooting. The complete fact sheet can be downloaded in a pdf format at ohio line.osu.edu/w-fact/pdf/0004.pdf. Follow its tips to help ensure your pets and livestock stay safe during the upcoming mating and pup rearing seasons. Please continue to send us your photos of Ohio wildlife. According to ODNR coyotes are growing larger in size in our area because they live loner w/o preditors. Don’t let the size confuse you to think its something else. Actual coywolf is still very low in population in Ohio. I seen two in Allen county on Thursday morning. My wife was visiting Columbus over the weekend. As she was in the Polaris parkway getting in her van after shopping she noticed about 10-20′ away, near a crick, a larger brownish bushy tailed wolf That she strongly felt could of been a wolf. The wolf then ran into the brush or crick. Be careful Columbus! I just moved on the W side of Columbus, Oh! 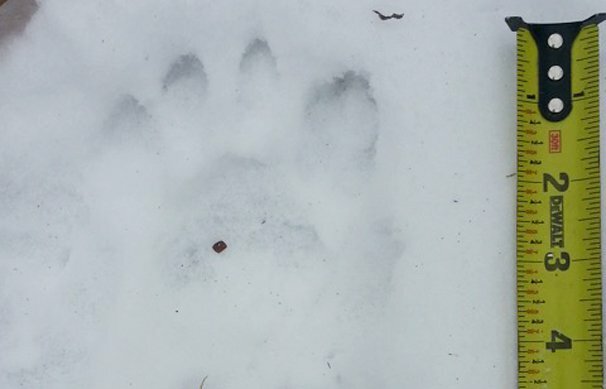 Woke up this morning & noticed big paws prints in the snow around my yard & in the wooded area! I did research & they look to be Coywolve tracks. It also 💩 near my neighbors front yard! She told me, one night she was walking her 🐕’s she was walking her 🐕’s back in the house & they was a wolf just sitting there starring @ her! I was a little skeptical, but she was not lying! & I also came out around 7am. I just moved on the W side of Columbus, Oh! Woke up this morning & noticed big paws prints in the snow around my yard & in the wooded area! I did research & they look to be Coywolve tracks. It also 💩 near my neighbors front yard! She told me, one night she was walking her 🐕’s she was walking her 🐕’s back in the house & they was a 🐺 , (not a dog or coyote, she said, it was bigger & she knows what a wolf looks like) just sitting there starring @ her & her 🐕’s…! I was a little sketical, but she was not lying! I came outside around 7am. It’s exciting & scary, cause u don’t know if they’re in packs or aggressive! Im outside alot, I love nature, but to have nature right before your eyes is wild! First time ever seeing they’re canid tracks! Just thought I’d share! Ha ha ha…you said coyotes are not natives to ohio and they entered in 1919…..Well with this reasoning..The people in América must return to Europe..only “Indian natives” must live there…with coyotes..OF COURSE! 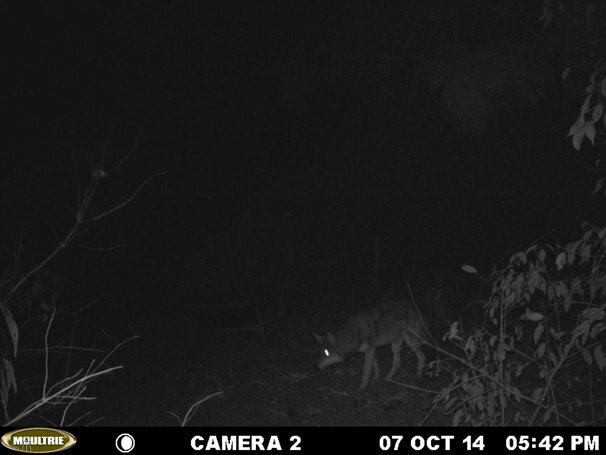 My daughter and son-in-law regularly catch coyotes on their trail camera in the backyard in Butler County, Ohio. Recently, a larger, fluffier, heavier built critter showed up. Looks very different from the regular coyotes, but we do t know enough to identify whether it is one or maybe a coywolf. Is there somewhere I can send a picture to get it identified? Thank you. I was driving up Sunbury rd between Gahanna and Westerville a couple nights ago, and just before the 161 and I-270 entrances, near Blendon Woods, I saw an animal bounding acroos the road in front of me. It looked like a large, shaggy, muscular wolf – too large and too wolf-like to be a coyote, but not giant – about the height of a baby deer. Guess it makes sense they’re getting bigger without predators. Saw what I thought was a Coyote until I got closer, we were driving East on 480 and it was off the freeway in a small grassy area. Now let me tell you this, this is not in rural country where I would expect to see one. This was not a pet dog. It was stockier than a coyote, taller and longer taking on more of the wolf features than coyote. My Partner and I said at the same oh **** there is a Wolf…We both thought maybe one had gotten loose from the Zoo but had not heard any reports of that. So still not sure if it was a coywolf or a wolf but it was definitely one of them. I can tell you it WAS NOT a Coyote the size does not match that of a coyote. It was beautiful. but not something I would have wanted to encounter on foot. This kid holding it up all proud is one heck of an idiot. You shouldn’t be gloating about any kill. Respect the land you live on. After killing one you have disrupted the pack. Only making things worse. You could try investing in a proper fence or a Donkey pair. 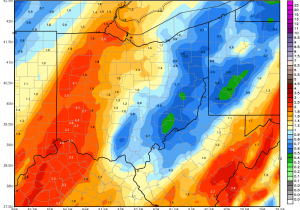 I hate these hill fucks in ohio. This past early march i caught and weighed a yote that topped out at 52 lbs. It was a monster to say the least. It was a male and l caught in a dirt hole set with beaver and comerical lure. It was caught on a hog farm in Muskingum County near the Perry County line. It was caught in a double set in an offset # 2 Bridger and an MB 550, one on each of its front feet. This has been a very active area for yotes for me for the past several years. To me, it just appeared to be a hugh yote, but who knows what it’s DNA could have shown. 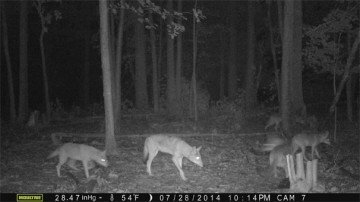 Last spring/early summer l was asked by the land owner to catch a yote that he thought had killed eight small pigs. I’m caught a big female near where they were killed. I have no real way of knowing if it was the exact culprit but l could not find more than one set of tracks in the adjacent areas and no more livestock was harmed.